Explore the world of birds in Eyewitness Activity Bird Watcher with more than 30 fun, hands-on activities Discover the exciting world of birds, from the different types of birds to bird song and migration. Learn how to become a bird watcher or understand the different tracks and trails with the help of Bird Watcher. Get making and creating: make your own nestbox, bird table and much more. Each of the 30 activities have easy-to-follow instructions and specially commissioned photography to help you complete each project as you make things for birds. 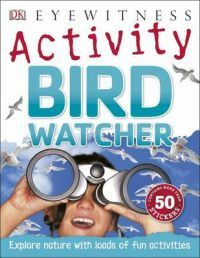 With more then 50 stickers inside to use alongside the activities, you'll have fun learning all about birds.